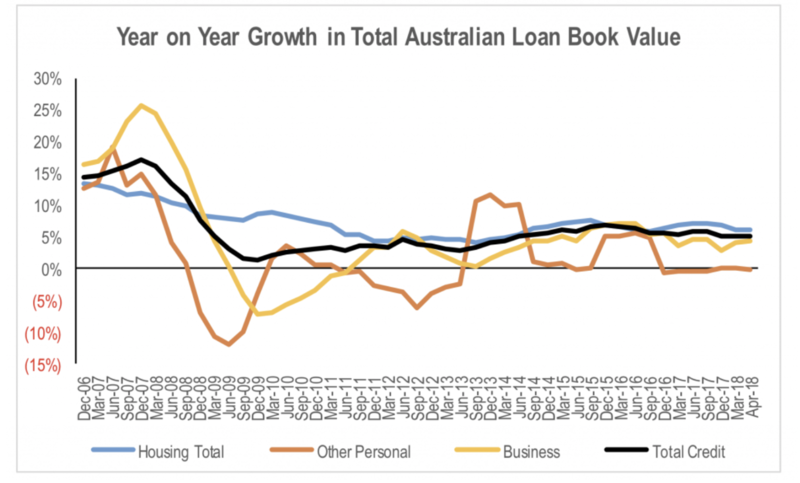 The statistical release of APRA and the RBA’s credit growth data for April shows a stabilisation in the rate of overall mortgage, personal and business loan book growth at 5 per cent across the overall Australian market. By category, mortgage book growth continued to slow, increasing 6 per cent year over year, while business loan book growth improved a little to 4.4 per cent. It appears that the Royal Commission had little impact on the aggregate market in March and April. If we break down the numbers to isolate the major banks from the rest of the market data, we see that there has been a divergence in performance since the December quarter of last year, when the major banks started underperforming in the mortgage market. Regional banks (Bendigo & Adelaide Bank, Suncorp, Bank of Queensland, Macquarie) mortgage book growth was even weaker than the majors in the second half of last year. 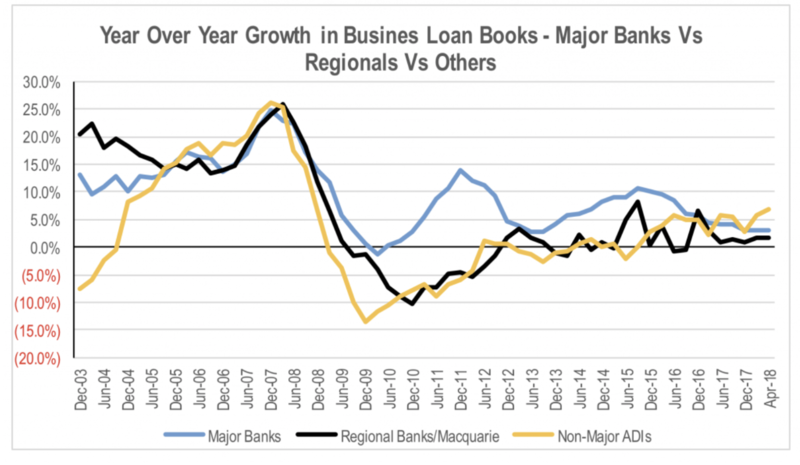 But what stands out is the surge in loan book growth for lenders outside of the big four and regional banks. This represents a significant change in performance for the smaller lenders after underperforming their larger competitors since the GFC. This is replicated in business loan book growth, albeit to a lesser extent, with loans book growth for smaller lenders recovering more gradually over the last 3 years, but also outperforming the major banks and other Authorised Deposit-taking Institution (ADIs). The improved competitiveness of smaller lenders has coincided with APRA’s imposition of restrictions on lending into certain categories such as interest only and investment property mortgages in 2016 and 2017. Scrutiny of poor lending practices by the Royal Commission has increased the risk aversion of the banks, while reducing their competitiveness from a service perspective and negatively impacting the amount of debt they can lend to an individual borrower. At the same time, the RBA has maintained the high level of monetary support in the market with official overnight rates remaining below the level of inflation. Even with the tightening of credit markets that has seen a sharp increase in the spread between the official overnight rate of 1.5 per cent and the bank bill swap rate (BBSW), the funding costs of smaller lenders and non-banks has become far more competitive. This is allowing them to offer rates on products that are often lower than the banks, particularly in those categories targeted by APRA’s restrictions. It should also be noted that the RBA only includes some non-banks in its aggregate market data. In a bulletin released in 2015, the RBA estimated that non-banks represented around 15 per cent of total financial system assets in Australia as at September 2014. This is likely to have increased over the last 5 years. Deducting the sum of mortgage books of the individual ADIs in APRA’s April data from RBA’s estimated size of mortgage books indicates that the RBA is capturing non-banks making up just of over 7 per cent of the mortgage market. Therefore, there is likely to be a large number of mortgages that sit outside the RBA’s data set. As a result, the RBA’s data could be understating the actual rate of growth in mortgage debt. Press articles have indicated that with APRA potentially easing some of its lending restrictions from July, the major banks are preparing to launch a major offensive in lending markets in order to regain lost share. Falling rates could lift credit growth in the second half of the year, but other factors such as the significant delays to application approvals from the need to verify expenses are likely to continue to restrict the big fours’ ability to win share even with lower rates. Restrictions and added regulatory requirements on banks in providing lending to small and medium sized business, such as a reduced ability to use the properties of relatives to secure a loan, would likely reduce the ability of the banks to grow their businesses in these segments. This will drive the growing amount of excess demand for credit toward smaller non-bank lenders that are not as restricted by increasing levels and greater enforcement/oversight of regulatory requirements. The benefit of this growing demand is likely to show up in the results of some companies that are listed on the ASX. The Montgomery Funds own shares in Westpac and the Commonwealth Bank of Australia.